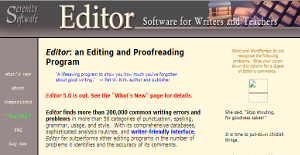 Editor is an editing and proofreading program designed specifically for writers and educators. The software can detect more than 200,000 common writing mistakes made by people especially in the areas of punctuation, spelling, grammar, word usage, and style. With Editor, users have access to a complete database that can assist them in drafting content that is free of any kind of errors. That is because the software is equipped with sophisticated error detection algorithms that enable it to point out mistakes and provide accurate explanations and comments. Moreover, Editor does not impose answers to users. Rather, the software offers ideas on how they can fix their sentences or paragraphs and let them decide how they will edit the section in question. With Editor, writers and educators alike can be confident that their documents and files are free of any kind of error. That is because the software is equipped with a comprehensive algorithm that can find over 200,000 common mistakes in writing. These errors are spread over 50 categories of punctuation, spelling, usage, style, and grammar. Users also have the power of an inclusive database within easy reach that enables them to learn more about the problems they have with their writing and to improve their skills further. Unlike other software that imposes answers on users, Editor simply makes comments and suggestions as well as raise questions regarding the content of a write-up. Whether users follow them or not is up to them. This way, they remain in control of their writing. Both British English and American English can find that Editor works well with either major dialects. The software can point out mistakes that are common and specific to either one to ensure the consistency of a document. Editor offers flexibility to its users in that they can choose which category of analysis to use when correcting their writing. They can turn these on and off as they wish to suit their specific writing needs. If you are considering Editor it may also be a good idea to investigate other subcategories of Best Grammar Checker Software collected in our base of B2B software reviews. It's important to note that almost no service in the Grammar Checker Software category is an ideal solution able to meet all the requirements of different company types, sizes and industries. It may be a good idea to read a few Editor reviews first as specific software might perform well exclusively in a very narrow group of applications or be created with a very specific industry in mind. Others might function with an idea of being simple and intuitive and as a result lack complicated features desired by more experienced users. You can also come across services that focus on a wide group of customers and offer a powerful feature base, however that usually comes at a more expensive price of such a solution. Ensure you're aware of your requirements so that you select a solution that has specifically the features you search for. How Much Does Editor Cost? We realize that when you make a decision to buy Grammar Checker Software it’s important not only to see how experts evaluate it in their reviews, but also to find out if the real people and companies that buy it are actually satisfied with the product. That’s why we’ve created our behavior-based Customer Satisfaction Algorithm™ that gathers customer reviews, comments and Editor reviews across a wide range of social media sites. The data is then presented in an easy to digest form showing how many people had positive and negative experience with Editor. With that information at hand you should be equipped to make an informed buying decision that you won’t regret. What are Editor pricing details? What integrations are available for Editor? If you need more information about Editor or you simply have a question let us know what you need and we’ll forward your request directly to the vendor.